My schedule for DNA presentations is lighter this year due to some other commitments. This is the schedule for the first half of the year. 12 March 2016 — Forensic Genealogy Institute, see post at http://debsdelvings.blogspot.com/2016/01/forensic-genealogy-institute-2016-dna.html for details. Check the link for registration information. 19 March 2016 — DNA Workshop at Waco-McLennan County Library. I'll be presenting in the afternoon. One session is "DNA, What Can it Do for Genealogy?" The second session is "Genetic Genealogy: Effective Analysis and Correlation of DNA Test Results." Morning sessions include Mildred G. Walker on "What is DNA?" and Drew Smith on "I've Received My DNA Test Results - What Now?" Jim Brewster of Family Tree DNA testing company in Houston will provide a guided tour of the company website. Check this link for registration information. 23 April 2016 — All-day DNA Workshop for East Texas Genealogical Society in Tyler. Check this link soon for registration information http://www.etgs.org/meetings.html. 12-17 June 2016 — Genetic Genealogy Tools and Techniques at IGHR. See http://debsdelvings.blogspot.com/2016/01/a-different-dna-course-ighr-gg-tools.html for more information and for registration links. 17-22 July 2016 — Practical Genetic Genealogy at GRIP. See http://www.gripitt.org/?page_id=1524 for details and registration links. I hope to see you all at one of these events this year. http://www.ngsgenealogy.org/cs/genetic_genealogy_autosomal_dna, National Genealogical Society: Continuing Genealogical Studies. NGS also offers an introductory Basics course at http://www.ngsgenealogy.org/cs/genetic_genealogy. This year at the Forensic Genealogy Institute I will present an all-day DNA Workshop for the novice and those who want to reinforce understanding of basic concepts of genetic genealogy. 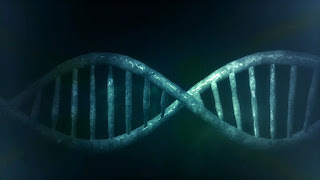 On Saturday, 12 March, participants who are interested in adding DNA to their list of services attend, "An Introduction to Forensic Techniques for Genetic Genealogy." Participants will be introduced to the foundations of DNA inheritance, analysis techniques, and reporting methods for forensic genealogy. This workshop provides an easy to understand explanation of complex DNA concepts. It includes a discussion of which type of DNA test can be used to answer which genealogical questions and practical experience applying DNA evidence to forensic genealogy cases. Attendees will participate in hands-on exercises in the following: Y-DNA, mtDNA, and atDNA case studies, and DNA tools. Beginning Forensic Techniques for Genetic Genealogy: Introduction to DNA inheritance, analysis techniques, and reporting methods for forensic genealogists. Y-DNA and mtDNA Case Studies: Hands-on exercises illustrating typical forensic cases. atDNA Case Studies: Hands-on exercises illustrating typical forensic cases. 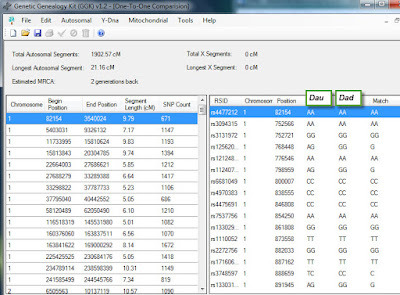 Case Studies using DNA Tools: Demonstration and discussion of tools that can simplify the DNA analysis seen in the case studies. The entire institute runs from 10 March to 12 March 2016 in beautiful San Antonio, Texas. The historic Menger Hotel will be the setting for the institute. 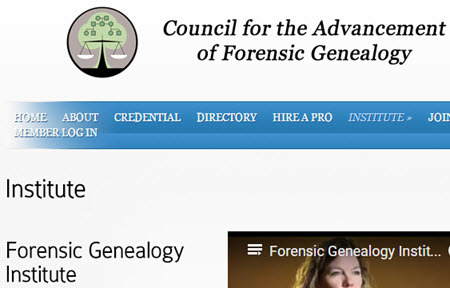 For registration information see Forensic Genealogy Institute, Council for the Advancement of Forensic Genealogy. Advanced genetic genealogists can attend the Advanced DNA Practicum instead of this introduction. Debbie Parker Wayne, "Forensic Genealogy Institute 2016, DNA Workshop," Deb's Delvings Blog, posted 22 January 2016 (http://debsdelvings.blogspot.com/ : accessed [date]). The Institute for Genealogy and Historical Research (IGHR) opened registration yesterday for the 2016 courses. We are offering a new tool-intensive course for genetic genealogy: Genetic Genealogy Tools and Techniques. We still have a few open seats in the course. Several people have questioned me about the difference in this course and about what is expected in the work sample if the person has studied on their own instead of attending one of the prerequisite courses. 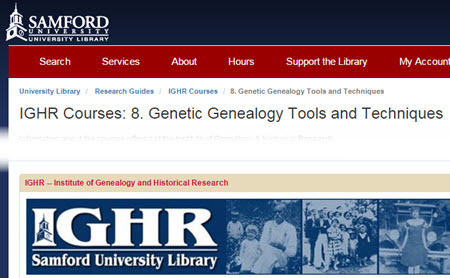 The IGHR course builds on the concepts taught in the GRIP Practical Genetic Genealogy and SLIG courses. The focus at IGHR is on how to use the tools to do the analysis — using the concepts taught in the earlier courses. The lectures will be a brief review, then in-depth on using the tool to analyze problems, then you actually use the tools yourself while instructors help you, if needed, and answer your questions. If you haven't taken one of the prerequisite courses you must submit a work sample demonstrating you have the knowledge taught in the prereq courses. The less class time spent on review, the more time we will have to spend on using the tools. The work sample must illustrate your analysis with details and not just contain a summary stating, for example, you helped a friend with an unknown line compare family trees of close DNA matches to find someone who might be her ancestor. Your work sample does not need to present a final conclusion, but must describe in detail the DNA analysis process. The citations and documentary research will not be judged — use the space to demonstrate you know enough about DNA to successfully complete the IGHR course. Pseudonyms can be used for privacy purposes, if needed, but the course coordinator (me) or instructors (CeCe Moore, Blaine Bettinger) will be the only persons reviewing the work and will not share the work with anyone else. Length should be no longer than necessary to demonstrate your understanding of DNA. For example, 5 to 10 pages: 1 or 2 pages with bullet lists for the blogs, books, courses, DNA sessions, and webinars you have studied; and 3 to 8 pages clearly indicated how you applied DNA analysis to one genealogical problem. If the work is still in process indicate what steps are planned next to reach a conclusion. The work sample should include details of the DNA analysis you have done. Details might include tools used for the analysis (company tools, GEDmatch, DNAgedcom ADSA or others, spreadsheets), number of testers, total atDNA shared and longest segments, chromosome number and start and stop point for shared segments, whether/how triangulation was used, whether/how In Common With matches were used, Y-STR values and knowledge of mutation rates impact on the analysis of differences, mtDNA differences from the rCRS, correlation of the DNA information with a family tree to find a common line, etc. random recombination, inheritance patterns, why using the X is different, etc. then it will be more difficult to follow the lessons in Genetic Genealogy Tools and Techniques. You don't have to be an expert on all of the topics listed above. You need to be familiar with the meaning of the items and you need to have done some hands-on analysis so you can follow the lessons in the course. You definitely need to know how to access all of the necessary websites on your own device which you will bring with you to Birmingham. We hope to see you there. This last year for IGHR to be in Birmingham at Samford University should not be missed. Disclaimer: As the author, course coordinator, and/or speaker, I have a financial interest in some of the educational opportunities listed below. How does one become a genetic genealogist? The same way one becomes a good genealogist or good at anything else - study and practice, study and practice, study and practice. New York Public Library, "Typical Study Room, Typing Room #220," digital image, Flickr Creative Commons (www.flickr.com : accessed 5 December 2011); New York Public Library Visual Materials / Lantern Slides / Research Library / Typing. There is no one path to becoming a good genealogist. There is no one path to becoming a good genetic genealogist. But no matter the path one takes, no matter the subject matter, practicing what is learned leads to proficiency and expertise. PublicDomainPictures, https://pixabay.com/, CC0 Public Domain License. For those who are self-learners, books and articles may provide the knowledge. For those who learn better in a classroom environment, courses are available, online and at institutes. Conference and society meeting presentations are a good starting point to see if you have an interest in a subject, but concentrated study and practical experience is required to become a proficient practitioner. The following lists some resources to get started. For all of the columns and blogs, start reading with the earliest articles. Once you understand the basic information you can then more easily grasp the intermediate and advanced concepts covered in more recent articles. National Genealogical Society, NGS Magazine "Genetic Genealogy Journey" column. I have been writing this column since October 2013. All articles are available in the members-only section of the NGS website (http://ngsgenealogy.org/). Older articles are available on my website (http://debbiewayne.com/presentations/gatagacc_biblio.php). National Genealogical Society Quarterly. Theme Issue on Genetics and Genealogy. Vol. 93 (December 2005). Genetic Genealogy, the Basics. National Genealogical Society. Continuing Genealogical Studies. http://www.ngsgenealogy.org/cs/CGS. Bettinger, Blaine. I Have the Results of My Genetic Genealogy Test, Now What? Self-published, 2008. Current v2.1 version. Family Tree DNA. http://www.familytreedna.com/pdf-docs/Interpreting-Genetic-Genealogy-Results_web_optimized.pdf. Bettinger, Blaine. The Genetic Genealogist. http://www.thegeneticgenealogist.com/. Hill, Richard. Guide to DNA Testing. n.p. : Atrax LLC, 2014. http://www.dna-testing-adviser.com/DNA-Testing-Guide.html. Hill, Richard. Finding Family: My Search for Roots and the Secrets in My DNA. n.p. : self-published, 2012. Moore, CeCe. Your Genetic Genealogist. http://www.yourgeneticgenealogist.com. Kennett, Debbie. DNA and Social Networking: A Guide to Genealogy in the Twenty-first Century. Gloucestershire, UK: The History Press, 2011. Russell, Judy G. The Legal Genealogist. http://www.legalgenealogist.com/. Shawker, Thomas. Unlocking Your Genetic History. Nashville, Tenn.: Rutledge Hill Press, 2004. This older book covers the basics on genetics, Y-DNA and mtDNA, but not the latest tests or in-depth atDNA. Smolenyak, Megan Smolenyak and Ann Turner. Trace Your Roots with DNA. Emmaus, Penn. : Rodale Press, 2004. This older book covers the basics on genetics, Y-DNA and mtDNA, but not the latest tests or in-depth atDNA. Wayne, Debbie Parker. Deb's Delvings Blog. http://debsdelvings.blogspot.com/. Wheaton, Kelly. Beginners Guide to Genetic Genealogy. https://sites.google.com/site/wheatonsurname/beginners-guide-to-genetic-genealogy. Practical Genetic Genealogy. 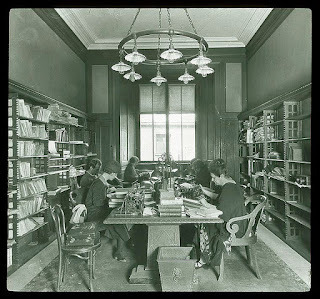 Genealogical Research Institute of Pittsburgh (GRIP). A full week of practical, hands-on experience analyzing and correlating DNA test results using the latest tools and techniques. Getting Started with Genetic Genealogy. Salt Lake Institute of Genealogy (SLIG). A full week of practical, hands-on experience analyzing and correlating DNA test results using the latest tools and techniques. Genetic Genealogy Standards Committee. Genetic Genealogy Standards http://www.geneticgenealogystandards.com/. Your local and regional libraries and special interest groups at societies for DNA-related offerings. As you read, practice what you learn using the DNA test results of your own family. After studying the items above, you should be able to determine which are your closest DNA matches and compare family trees looking for common ancestors. You should be able to compare the STR values of Y-DNA testers to determine if testers likely have a common ancestor or not. You should be able to determine how closely two mtDNA or Y-DNA testers match each other. You should be able to determine how closely atDNA testers may be related, as in first to second cousins, second to fourth cousins, distant cousins, etc. Hollister, Morna Lahnice. "Goggins and Goggans of South Carolina: DNA Helps Document the Basis of an Emancipated Family's Surname." National Genealogical Society Quarterly 102 (September 2014): 165-176. Jones, Thomas W. "Too Few Sources to Solve a Family Mystery? Some Greenfields in Central and Western New York." National Genealogical Society Quarterly 103 (June 2015): 85-103. Mills, Elizabeth Shown. "Testing the FAN Principle against DNA: Zilphy (Watts) Price Cooksey Cooksey of Georgia and Mississippi." National Genealogical Society Quarterly 102 (June 2014): 129-152. The articles above are available in the members-only section of the NGS website (http://ngsgenealogy.org/). More advanced articles on the blogs listed above. Genetic Genealogy, Autosomal DNA. National Genealogical Society. Continuing Genealogical Studies. http://www.ngsgenealogy.org/cs/CGS. Aulicino, Emily D. Genetic Genealogy: The Basics and Beyond. Bloomington, Ind. : AuthorHouse, 2013. Christmas, Shannon. Through the Trees. http://throughthetreesblog.tumblr.com/. Dowell, Dave. Dr D Digs Up Ancestors. http://blog.ddowell.com/. Estes, Roberta. DNAeXplained - Genetic Genealogy. http://dna-explained.com/. Institute for Genetic Genealogy. http://i4gg.org/. Video recordings of conference sessions are available to view online at a very reasonable price. Owston, Jim. The Lineal Arboretum. http://linealarboretum.blogspot.com/. Perkins, Steve. On-line Journal of Genetic Genealogy. http://jgg-online.blogspot.com/. Journal of Genetic Genealogy (JOGG). http://www.jogg.info/. Genealogy DNA List on RootsWeb. http://lists.rootsweb.com/index/other/DNA/GENEALOGY-DNA.html. Autosomal DNA List on RootsWeb. http://lists.rootsweb.ancestry.com/index/other/DNA/AUTOSOMAL-DNA.html. Advanced Genetic Genealogy. Genealogical Research Institute of Pittsburgh (GRIP). Genetic Genealogy Tools and Techniques. Institute of Genealogy and Historical Research (IGHR). Advanced DNA Analysis Techniques For Genealogical Research. Salt Lake Institute of Genealogy (SLIG). DNAadoption courses. http://dnaadoption.com/index.php?page=online-classes/. Several courses are offered on atDNA and Y-DNA with others to be added in the future. Become a project administrator or assistant administrator for a DNA project - Y-DNA, mtDNA, atDNA, regional, or a haplogroup project. This will expose you to situations beyond those seen in your own family. Genetic genealogy courses are also offered by other groups such as Family Tree University (https://www.familytreeuniversity.com/), Virtual Institute of Genealogical Research (http://vigrgenealogy.com/), and University of Strathclyde (http://www.strath.ac.uk/). Continue practicing newly learned techniques using the DNA test results of your own family and consenting project members. Incorporate segment analysis and triangulation of segments. Try to determine which DNA segments were inherited from which ancestors when you have several testers with robust, accurate, and complete trees who share overlapping DNA segments. Start with segments larger than 10cM or so; smaller segments are difficult to confirm and can mislead novices. Test out standalone tools and third-party websites discussed in the books and articles. Write up your findings incorporating both documentary research and the DNA results. A skilled genetic genealogist must also be a skilled genealogist. Credible conclusions are reached by correlating DNA evidence and documentary evidence. DNA is one more tool in the toolbox of a good genealogist. In the same way you learned to analyze tax roll details and odd phrases in probate or deed records, you must learn the oddities of genetic evidence. Random recombination and inheritance patterns can complicate analysis because there are multiple scenarios by which specific test results could have occurred. Statistical probabilities play a role. Ask skilled friends to critique your writing, giving constructive feedback, good and bad. When you feel confident in your writing submit the article to a peer-reviewed journal for publication. Genetic genealogy is a complex subject, but if you can learn to become a good genealogical researcher you should be able to become a good genetic genealogist. You must be willing to invest the time into learning the concepts and analysis techniques that are unique to genetics and practicing the techniques to become proficient in multiple situations. When "random" factors are involved, you can seldom ever use the words always or never. You must have a deep understanding of concepts to be able to judge the likelihood of an event. 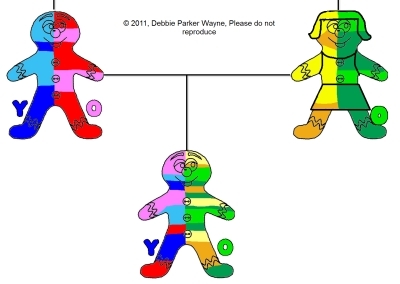 Debbie Parker Wayne, "Becoming a Genetic Genealogist," Deb's Delvings Blog, posted 12 January 2016 (http://debsdelvings.blogspot.com/ : accessed [date]).